With DFRF Enterprises offering 15% a month perpetual ROIs on affiliate investments running into the tens of thousands, it was only a matter of time before regulators came knocking. That they did on June 30th, with the SEC filing Ponzi fraud charges against Daniel Filho and his $15 million dollar Ponzi scheme. DFRF Enterprises’ particular Ponzi ruse saw Filho (right) claim DFRF’s perpetual 15% a month ROIs were sourced from gold mining operations in Brazil and Africa. The company also claimed to have Swiss banking connections, that investor funds were guaranteed and that 25% of all company revenue was donated to charity. One recent point of contention was Filho’s announcement that he had registered DFRF with the SEC. This announcement was made back in May, with the scheme also name-dropping the FBI in their marketing. When Filho announced that DFRF had registered with the Commission and its stock was going to be publicly traded, receipts from investors soared to more than $4.3 million. Attempting to position themselves as being fully registered with US regulators, Filho ultimately failed to disclose how and through what company name he registered DFRF Enterprises through the SEC with. Because according to the SEC it was all just a bunch of porky pie lies. Virtually all of (Filho’s) public statements about DFRF have been materially false and misleading. There are no gold mines. There is no (Swiss) credit line. There is no charity work. There is no stock registration. There is no (investor) insurance. DFRF bank documents indicate that none of the investor’s money has been used to conduct gold mining, and DFRF has received no proceeds from gold mining operations. DFRF bank documents reflect that DFRF has received no proceeds from a credit line with Platinum Swiss Trust and, in fact, has no banking transactions with it at all. Bank documents reflect no spending by DFRF on any charitable activities in Africa or anywhere else. DFRF has not registered, or attempted to registere, its stock with the Commission (SEC). There is a real company called Accedium Insurance Company registered in Barbados and London. However, it is not a top-rated insurance company. Infact, none of the four lending rating services assigns it a rating. DFRF bank documents reflect that DFRF has paid no premiums to Accedium and, in fact, has has no banking transactions with it at all. When exactly the SEC began investigating Filho and DFRF is unclear, but we do know they were assisted by a number of regulators both in the US and abroad. DFRF itself got off the ground in mid 2014, with Filho personally soliciting investment in Massachusetts. Call me cynical, but this was probably a deliberate attempt to target TelexFree victims. TelexFree was shut down by the SEC in April, 2014. The $1.8 billion dollar Ponzi scheme had a massive following in Massachusetts, which is where Filho canvassed for early investors. Further cementing links between TelexFree and DFRF, is Filho’s payment of $310,000 to Sanderely Rodrigues. Rodrigues was the top investor in TelexFree, having stolen upwards of $3 million from investors around the world. Filho has caused DFRF to pay more than $310,000 for the benefit of Sanderley Rodrigues de Casconcelos. On March 21, 2015, Filho caused DFRF to pay $50,000 to a business belonging to Rodrigues. The payment was made less than one month after Filho publicly denied any link between DFRF and TelexFree. On March 30, 2015, Filho caused DFRF to pay $100,000 the same business. On April 2, 2015, Filho caused DFRF to supply more than $160,000 so that another business belonging to Rodrigues could purchase a 2008 Lamborghini sports car. Rodrigues is currently a defendant in the SEC’s civil lawsuit against TelexFree. He is also facing criminal charges for visa fraud and evading Brazilian authorities. there is no evidence that Rodrigues provided any services or other benefit to DFRF. All in all, DFRF Enterprises took in some $15 million from 1400 investors around the world. The scheme has no source of revenue, other than affiliate investment. Bank documents reflect that, from June 2014 through May 2015, DFRF had no independent source of revenue except the money received from investors. Because (DFRF) has no independent source of revenue, it is apparent that, in classic Ponzi scheme fashion, DFRF is using money from some investors to pay other investors. Of the fifteen million taken in, $1.6 million was paid back to investors. Filho has used investors’ money for his personal benefit. Since June 2014, he has siphoned more than $6 million out of DFRF, approximately 40% of the total received from investors. This includes more than $1.8 million in cash withdrawals, approximately $1.8 million for personal expenses and almost $2.5 million to acquire a fleet of luxury automobiles. A 2014 Rolls Royce, a 2015 Lamborhini, a 2014 Lamborghini, a 2012 Ferrari, a 2006 Ferrari, a 2013 Mercedes, a 2015 Cadillac and a 2014 Cadillac. While Daniel Filho spun a web of lies about gold mining operations, SEC registration and donating funds to charity, the reality is he was using stolen investor funds to live the high life and purchases exotic automobiles. The investors’ money has not been used to conduct gold mining, pay for a credit line, purchase insurance, or endow charitable activities. DFRF has received no proceeds from mining operations or any credit line. Breaking down two of the bogus complaints Filho used to market his scheme, we shed some light on two key DFRF insiders. The notion that DFRF investor’s investments were insured was repeatedly used to reassure those that sought Ponzi riches through DFRF against risk. Jeffrey Feldman was used to represent DFRF’s insurance deals, with the SEC revealing just how full of crap Ponzi insurance claims can be. Jeffrey Feldman is the sole officer and director of Universal Marketing Group, a Florida corporation. He claims to be the U.S. representative of Accedium Insurance Company, which is based in Barbados and London. In July 2007 he filed for personal bankruptcy. In 1998 he was found guilty of fraud and forgery for having received $2.5 million in premiums from a rental car chain for insurance policies that he did not actually obtain. In 1996 the state of Florida revoked his license to sell insurance after he pleaded no contest to charges that he submitted false insurance claims for losses he supposedly suffered from Hurricane Andrew. Feldmen is a convicted felon, and Florida revoked his license to sell insurance in 1996. Neither Accedium nor Feldman’s business, Universal Marketing Group, is licensed to sell insurance in Florida. Yeah, so this is the guy who Filho insisted was”guaranteeing” everybody’s money. Heriberto Perez Valdes is a manager of the Massachusetts DFRF entity with responsibility for “all administrative and executive work”. For their part in assisting Filho in orchestrating multi-million dollar global Ponzi fraud, both Feldman and Valdes are named defendants in the SEC’s case. Valdes received over a half million dollars in stolen Ponzi funds, Feldman $252,000. In their June 30th complaint, filed under seal, the SEC sought to freeze the assets of DFRF Enterprises and Daniel Filho by way of a preliminary injunction. Of particular note is that several top DFRF Enterprises investors are also named in the SEC complaint. Wanderley Dalman ($51,000), Gaspar Jesus ($56,000), Eduardo Da Silva ($221,000) and Ramildo Cunha ($33,000) were all primary pushers of Filho’s DFRF Ponzi scheme. They are all named defendants and subject to the preliminary injunction terms above (if granted). The SEC’s complaint was filed in the Massachusetts District Court, so unfortunately isn’t showing up on Pacer. Given that the complaint has been unsealed however, I’m confident the SEC’s preliminary injunction was granted (this is inline with what I’ve seen in other sealed SEC Ponzi complaints). Early last month Filho told DFRF investors that “nobody can stop the company”. [5:48] Today we don’t have one single point of failure, but we have several points (and) we can rotate it. [5:56] We can shutdown one point and upload in a matter of seconds. Whether or not an SEC investigation and regulatory shutdown constitutes a “point of failure” in Filho’s eyes is unclear. Ditto whether or not the DOJ will followup the SEC’s civil complaint with criminal charges. Update 11th September 2015 – Heriberto Perez Valdes has thus far failed to respond to the SEC complaint, with the agency seeking default judgment against him today. If granted, Valdes will be up for over half a million dollars plus interest. My guess is he’s gone into hiding. and sann rodriques had his hand in the DFRF pie too? it’s obvious he must have given zeek investor data to filhos in return for which he received funds. everything filhos said was a LIE! everything! i cant believe a guy can stand before a camera and lie to the world like that! i think the court will ask for psychiatric evaluation of filhos, just like they ordered for rodrigues. there is something ‘not right’ in these people’s heads. Sann Rodrigues is Brazilian, enough said. What I am surprised so far is why haven’t the DEA gotten involved, given the alleged links between DFRF and the Sinaloa Cartel, or maybe they’re just waiting in the wings? And you know Filhos will just turn it around and claim he was tricked too. That those people lied to him. Then those people will throw him under the bus by turning Federal witness. And you know Filhos will just turn it around and claim he was tricked too. By who, the Mexican mafia? Don’t forget, Filho, like Rodrigues, has already busted by the SEC. He’s violated that settlement so I’m pretty sure there’s more to come (DOJ or DEA as you mentioned). Oz: Don’t forget, Filho, like Rodrigues, has already busted by the SEC. He’s violated that settlement so I’m pretty sure there’s more to come (DOJ or DEA as you mentioned). well, they’d better be involved this time around. look what settling with filhos the last time around had led to! Oz: (Filho tricked) By who, the Mexican mafia? The guys who played the head of Swiss Bank Trust and Accedium Insurance. It’s far more likely they were set up by Filho through a cutout, and these two dupes get to play big shots at meetings and they thought it’s cool and they get paid. They don’t realize (or maybe they do) they are accessories to fraud, or even co-conspirators. It wouldn’t surprise me at all, as people have impersonated all the way up to Federal Reserve Chairman and his staff in various scams. I can dig up the reference, but it’s one of those Forbe’s articles. Its a shame how the latin MLM blogs are so full of sh*t, i mean, they wont even due research on a company before endorsing. Found it: HYIP that claimed to be a secret program by the Federal reserve… that’s generating so much profit, it promised crazy rates AND that’s AFTER they donated 1/3 profit to charity and the Feds get the other 1/3. Oh, and it’s not stored by the Feds, but by a SWISS Bank account. No, I’m NO making this up. a message yesterday, from daniel filho, which utterly ignores the SEC’s finding that he has got no mines and no gold. in the face of an SEC shutdown this guy just wants to take his business out of the US. if there are no criminal charges against him,i think he will run and start his ponzi from some other country. this guy is buttcrazy. Hello my brothers. This is an important announcement, Faith and demonstration that we are not intimidated by anything. • He came to our door open conspiracy to overthrow the (not only cyber attacks, blogging, but creating a factory fabricated allegations, many of them anonymous) and possibly for the purpose of compromising my personal safety because of our social works and open growth rise in the market. “It’s good to know that we are now troubling on another level.” We were happy to bother playing dirty. • “If” every operation in the United States suffer interventions will not affect absolutely NOTHING in our performance in the world market. • You take care to relocate all our processing platform outside the country for more than 3 months, so we are safe, especially with a “liquidity” extraordinary. • We will continue taking care of all of our management, also of our Managers and especially our members. • We will make several announcements, probably every week and promote more events than we are doing nowadays; we will not to provoke but to prove our position globally. • The local government can not know, or how to find or even dream how, where, why and how we do, we do and we can go from “unlimited” way. • Laws in the United States are very complex, here everything is very strict, narrow and when there are formal complaints, agencies are required to take action. Knowing this, those who declare themselves openly as our enemies, to use the time to “hundreds” of complaints in order to lead the investigation. • We have our assets today LIQUID form and spread across 29 countries. Even if we were to paralyze ALL and any production, we have physical gold and enough money to maintain and support to ALL Members for the next 200 years. • For now we are neutral, late on Friday, when I’ll have a personal meeting with the American government in Boston. • After that, we will take ‘conservative’ measures only within the United States, we will continue with our mission to settle with ALL Members American residents and relocate “officially” our base and platforms in less problematic jurisdiction level operational due to the laws governing the sector. • This country is wonderful, my whole family is American, I have no intention of changing position, but take care that our members have the added peace of mind possible, knowing that we are already operating in a safe soil and less bureaucratic. This will run in record time. • Living in America, eat here, but operate in another base, so let’s keep our local facilities based consulting and develop new foundation, since not had time to work with this new social identity, only with the old one. • Let us in faith, mutually supporting us and demonstrate IMMEDIATELY ALL of our members, that actually “we are different” and extremely solid, immovable. • Possibly have to relocate the master platform and technique, this addition to take a little time, we believe that between 60-90 days where possibly we can not accept any credit in the United States, or process data from other Member countries here in American territory. We have the solution for this. We will have to work much harder over the next three months, but it will be worth it. • All debit cards will be issued, processed and distributed in another base outside the United States. We will be allowing all still this week. • It is almost 100% sure the change in our public stock market to another jurisdiction, it will bring more comfort and confidence to all. • Gains, income and recovery will be “EVEN MORE”. • all Members who have made ​​the release of contributions before maturity and consequently lost some days, weeks and maybe even some lost up almost the whole month because he was already close to winning to earn income “to” 15% We will pay for all, we will also make the 10% contribution to those who did not receive more commission per referral. • Only by speculation relocate our public operation, the valuation was stupendous, we have passed the $ 75. Let’s consolidate, relocate and invest a small fortune in big advertising worldwide. • All operations are and will continue normal in the rest of the world except the United States until we complete the settlement process with Members, as previously announced by us for more than four months. • The priority is to immediately liquidate ALL residents Members in its entirety credit and do not allow new claims, whether they are members or American residents of any other member worldwide wishing to make credit in the United States. • Sometimes a scare serves to open our eyes, but always strengthens us. • The higher the provocation, the greater is our victory. • Stay in Peace, we will continue in open and PERMANENTLY communication, producing more informative videos over the next two days and after the weekend, we will work conservatively in America, but will operate for INTENSE of the rest of the planet. That’s an auto-translation from one of the Brazilian spam blogs is it not? Treat it as suspect until something appears on an official DFRF online property. We saw the same garbage when TelexFree was shut down. Filho and DFRF are finished, they will let him surrender the money voluntarily or go after it wherever he has hidden it. Some alleged “insider” always claim to be spilling information. When Zeek shut down there was a “confession” on Reddit, of any place it could be. No Mister, not “enough said”. I am brazilian too and I am not a crookie like Rojo Filho. In opposition, I expose Ponzi scammers on the internet, just like you, Oz, PP and so many other coleagues do. I respect and admire your work, specially the psychological approach, thats why I recommended your blog to several friends of mine. But please, don’t come here with those kind of lines, not in 21st century. But I won’t do it, my friend, cause is just unfair, provocative and pointless. About the matter itself, I think it becomes clear that authorities were investigating the scheme for several months ago. I though so weird that SEC didnt issued a public warning about the suspicous activities of the company. But now I suspect they were giving time for the investigation, so they could collect more data to build a strong case. As far as I know, CVM (“brazilan SEC”) is also investigating. Let’s see how many days before freezing their assets also here in Brazil. I need to stop posting when my thoughts were incomplete. What I meant to say is Sann Rodrigues is Brazilian like Filho, and are in the same scam industry. I apologize too if I sounded somehow rude in my reaction. I KNEW IT FROM THE FIRST MOMENT THAT THIS WAS GOING TO BE FRAUD. The general pessimistic mood, terrorism, ISIS, Greece, Europe (EU affected by Greece), China (economy slowing)… makes people nervous, so they want to earn money FASTER. The growing gap between the richest and the poorest makes the middle class complain about “unfairness” (remember “occupy” protests a few years back?) and when some scammers pop up and claim they can level the playing field, and they have secret / new ways of making $$$, people listen, because it’s what they are looking for, or at least appear to be. The problem with such is always one of simple logic: if they know the secret way of making money, WHY would they be sharing with you? Why don’t they just mortgage their house / car and borrow a good chunk of money and earn lots and lots of money? Why do they need YOUR money? DFRF is somewhat unique that Filho has some interesting ties with the mafiosos such as Sinaloa Cartel and may even be laundering some drug money. David Murcia Guzman of Colombia is believed to have been laundering money for the Colombian Cartels while his DMG Grupo was in full swing. David Murcia was nabbed in Panama and sent to Colombia, who sent him to the US to be convicted here and serve prison first, then sent back to Colombia for more years in prison. But the tales Filho spun are quite tall indeed. Amazing how this joker can still hold his head up high and claim that nothing is wrong…. a message yesterday, from daniel filho, which utterly ignores the SEC’s finding that he has got no mines and no gold. I don’t believe this msg is from Daniel. It seems to be written by Mysael Serra, one of the managers in Brazil, that wrote so many other msgs in one of the many DFRF ‘official’ websites. Guess who’s the owner of the site ? Wouldn’t be surprising to see him writing **** like that just so he has a window to escape from. Or he’s as delusional as Costas of TelexFree. It was written by Mysael Serra, the site owner, trying to pretend is from Rojo Filho. They are extending the fraud here in Brazil, once ‘our SEC’ didnt do anything till now to stop them’. We saw the same happening with iFreex. After Sann got already arrested, a couple of top promoteres kept people in hope, so they can cash out the last idiots. You can see Daniel doing the same in Canada: After Britsh Columbia SEC issued a warning he MADE A VIDEO RIGHT AFTER, and right there to collect the last dollares from the ones not that well informed. GateHouse Media sounds like a PR firm. Maybe they’re linked to all the “Daniel Filho is the second coming of Christ” type press-releases published over the last few months. GateHouse Media is real company and operates multiple newspapers. This may be one single reporter under their various brands going rogue or got his mixed up in this mess. Who is “Beto Morais”? He’s credited as “reporter, Gatehouse media group” interviewing DFRF head honchos. DMPontes: This was posted in GateHouse Media official page on facebook. Could anyone help to support with comments ? In Orlando, a representative of the Guinea-Bissau government, Helmer Araújo, announced that the president of DFRF Enterprises, Brazilian entrepreneur Daniel Filho, has been appointed to take over as honorary consul for the country in the United States. “Daniel Filho has become our honorary consul, tasked with the responsibility of establishing business between our country, the United States and other world powers. i wrote to helmer araujo to confirm this, but haven’t received any reply yet. something tells me he wont be replying any time soon! either he’s in on filho’s game or will be embarrassed. You’re right: Helmer is part of Filho’s game. He is NOT representative of Guinea-Bissau. He is being portraited as so, but he’s just a SON of the real Guinea-bissau consul in Brasil, his mother, Eugenia Araujo. But even if it was Eugenia herself in the video this wouldnt mean much. There is a video of her being used for propaganda as well. You’re right: GH is completely inocent and hav no idea one of their journalists is involved in DFRF. Beto works for GH, and also works as DFRF journalist, and that’s ok. The problem begins when they USED GH’s name to lend credibility to DFRF. This is what we are alerting to GH. He owns several blogs, a facebook page and a radio show in the US, all channels he uses to spread propaganda of the scheme to the brazilian community. In a video Daniel THANKS his team ‘Beto potential gold’ for the performance in recruiting fools. Well I realize I may wasn’t being clear enough. When I asked you to ‘help to support with the comments’, I was referring comments THERE, ON GH’S FACEBOOK POST ! I believe the more people support what’s being said by Jairo Rodrigues there, the more likely for GH to respond. Universomlm is owned by a major hispanic leader of Telexfree that defrauded many people through his garbage site. Before Telexfree fall, the site promoted Telexfree scam to 100% . Now they hide behind the facade of what they call “MLM magazine”. But they still continue promoting and recruiting for ponzi schemes. The information they offer is simply rubbish. It contains many errors because are “translations” of English sites. They only publish information of some recognized and legitimate multilevel companies to hide their true goal: Cheating people with ponzi schemes of which they are members. Is best stay away from that scammer site. DMPontes: You’re right: Helmer is part of Filho’s game. Distraction tactic. Filho is trying to divert attention from himself, as he’s getting too much camera time, which also means his connection to the Sinaloa Cartel is getting a lot of heat. Money laundering is is something done in secret, not loudly promising bazillion bucks to hundreds / thousands of people at seminars / parties. daniel filho will be gracing the cover of a magazine called brazilUSA magazine in it’s july 2015 edition. 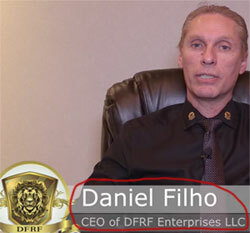 Our CEO Daniel Filho, still working with lawyer to bring DFRF Enterprises LLC -Official – to a new different level! Stay tuned for more news! The picture bellow is for the new Brazil USA magazine for this month. July 9.
i think he has transferred his ponzi funds out of the USA, and will continue his business. this guy doesn’t care a frig about the SEC at all. hello, is anyone framing criminal charges against this guy, or will he strut hollywood style on magazine covers for all time to come? I think that article was probably organised (paid for) well in advance. Filho is rooted in the US, he’s not about to up and do a runner. Just like he supposedly got an award from a Brazilian magazine called “FAMA” a few months ago, right? NOBODY heard of it except from his own press release. This is much like some moron councilor that tried to give Sann Rodrigues an award. Remember that? Same idea here. It’s in Portuguese so obviously for Brazilian expat consumption (not for the general public). Why in the world SEC don’t arrest this guy, like they did with Sann Rodrigues ? That might be a Chinese domain but the site itself is still hosted in the US. Filho is under the SEC hammer and playing around isn’t going to end well for him. My bet is one of his cronies is trying to keep the dream alive (that won’t end well for them either). Filho has an injunction out against him ordering him to stop committing fraud (which includes running DFRF). If DFRF isn’t offline by the next hearing I don’t see why the SEC can’t claim Filho is in violation of the injunction. Article updated with news of SEC’s Motion for Default Judgement against Heriberto Perez Valdes. Scheduling conference still set for September 29th.